The hosts were wonderful, so kind, regularlly made us fresh Greek Coffee. We urgently needed a place to stay as I made a mistake with other reservations and the hosts were happy to have us and arranged everything promptly and with ease! The place was really cute! The hosts were super friendly and helpful! We liked everything in Spiridoula. The hosts were helpful, friendly and wonderful. It was very clean also and there was basicly everything there we needed...The most friendly people we have ever met. Spiridoula Villa we hope to come back. Very clean, they cleaned the room perfectly every day, friendly and helpful staff, quiet location, basic but with everything we needed. Good value for money. Everything was very good. The place is very clean, well located and people are nice. Very clean, the building has a beautiful local architecture and is very close to the beach. The kitchen facilities in the room are more than enough for a breakfast/ easy lunch and there are plenty of places with very good food nearby. Very good location, 5 minutes walk to the beach but very quiet; very clean place, fresh towels every day, room cleaned every day, a/c, tv, good Wi-Fi, nice sea view terrace where we enjoyed our meals, fully equipped kitchenette, supermarkets nearby, bus stop nearby. Katerina is a great host who gave us all the information about the island and places to visit and a nice little present to remember us of the amazing holiday we had in Santorini. Very nice place, friendly and helpful staff, 5 mins walk to the beach and restaurants, I would recommend it! The hosts are very welcoming and helpfull. Good location and nice place to stay. Lock in a great price for Spiridoula Villa – rated 8.8 by recent guests! Just 1,000 feet from the black beach of Perissa, Spiridoula Villa offers accommodations with a terrace or balcony overlooking the mountain and Aegean Sea. Various shops, cafés and restaurants are located nearby. A kitchenette consisting of cooking hobs, electric kettle, fridge and a coffee maker is featured in all the studios. Each is air conditioned and includes a safe, small dining area and satellite TV. 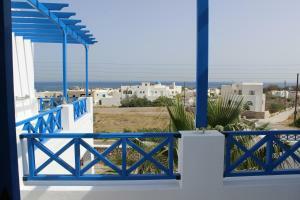 Spiridoula Villa is 800 feet from a bus stop and the center of Perissa Village. The bustling town of Fira is at 7.8 mi, whereas Santorini Airport is at a distance of 8.1 mi. When would you like to stay at Spiridoula Villa? Offering mountain and Aegean Sea views from its terrace or balcony, this studio has a well-equipped kitchenette with cooking hobs, kettle, coffee maker and fridge. It includes air conditioning, a satellite TV, safe and small dining area. House Rules Spiridoula Villa takes special requests – add in the next step! Spiridoula Villa accepts these cards and reserves the right to temporarily hold an amount prior to arrival. Please inform Spiridoula Villa of your expected arrival time in advance. You can use the Special Requests box when booking, or contact the property directly using the contact details in your confirmation. The bathroom was a little bit old, some refurbishment could be useful. The only down is that there is nobody there to receive you when you arrive and you only find the reception door closed and a letter with a phone number to call. For me was fine cause I have free roaming all over Europe and luckily I had enough money on my plan but if you happen to do t have money on your phone you are screwed. I understand that is kind of low season already but when the host is not gonna be there at your arrival you will expect at least an email to get communicated of that. I prefer a closed shower as I am stressed out not to fill the bathroom with water. Everything, catalina was the most amazing host, would definitely stay here again. Very kind and helpful host Catherine. Very nice, clean and quite location, 5 minutes walking distance to a black beach, the main bus station, water taxi to Kamari, various restaurants, car/quad rental, tourists offices offering trips to interesting places in Santorini, a shopping center and a bakery with Greek specialities. Excellent starting point to Ancient Thera path with a "donkey station" nearby. If you prefer silence in the night than noisy places at main streets it is an ideal area to stay. The villa was a little bit far from the beach.. but it is not critilac problem.. only 8-10 minutes walking.. Generally we were satisfied. Host was a young lady - very kind. After check-out she allowed us to use a bathroom in the evening. The hosts were delightful, made us feel very at home! Wi-fi signal was sometimes dodgy. Worked in certain areas of complex..but slow. We tended to use bar Wi-fi in day and evening when we were out. No use of neighbours swimming pool because it wasn’t filled with water. But they appeared to be filling this when we left. Our stay was too early in season I think. We arrived via hoppa travel bus (cheap and excellent) from very late flight and friendly courteous host waited up till 1.30am to greet our arrival! Accommodation had glitch with toilet flush, but host changed our appt instantly next morning. Appt comfortable and clean and towels and bedding changed and appt cleaned daily. Lovely terrace with mountain and distant sea views. Quiet villa. Granddaughter Katrina and her Grandmother proprietor excellent very kind and friendly hosts. Villa was 5 mins walk from sea and resort. Sand is black volcanic. Recommend using the bar owned beaches with free sun beds as long as you buy a drink from them. Villa in excellent position for everything, inc.using local bus. We were allowed free late check out for whole of day till 10pm as bus return pick up not till 10.15pm for late flight...and there were no tourists coming to apartment that day. Definitely recommend this appt complex and will return again in future.